This illustration comes from a series of handscrolls telling the legends of the Shinto Kitano Tenjin Shrine, located in Kamakura, Japan. The shrine is dedicated to Sugawara no Michizane, a 9th century scholar, poet, and statesman who came to be deified as Tenjin, the Shinto god of learning. Kamakura period (1185–1333). 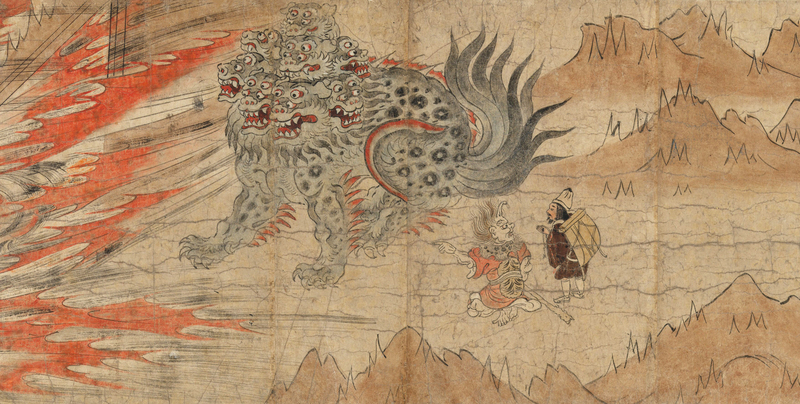 This entry was posted in Uncategorized and tagged 12th Century, 9th Century, Art, Books, Japan, Monsters, Religion, Shinto, Sugawara no Michizane. Bookmark the permalink.